Adapted from "Mollie Katzen's Vegetable Heaven"
Chop the pineapple into small pieces, saving as much of the juices as possible. 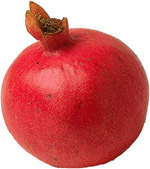 Put the pineapple juice and the pomegranate seeds in a food processor, and pulse several times to mince the fruit almostbut not quiteto pulp. Transfer the mixture to a shallow glass bowl or pan, and add ginger and the mint, if desired. Taste for sweetness, and add sugar if necessary. Place the bowl or pan in the freezer, and freeze for 3 hours, interrupting it every 30 minutes or so to poke it assertively with a fork. Then cover the bowl or pan, and fd freeze overnight, or for a minimum of 6 hours. About 15 minutes before serving time, take the granita out of the freezer and let it sit at room temperature. Just before serving, drag a fork through the granita to break it into tiny ice crystals. Serve right away in stemmed glassware, for a particularly elegant presentation. Garnish with sprigs of mint, if desired.